The chapter begins by highlighting the relevance of the spiritual in David Greig’s work via a discussion of Greig’s creative engagement with shamanism. It coins the notion of the “shamanic semionaut” to describe the playwright (the second term, “semionaut”, is borrowed from Nicolas Bourriaud). Rodríguez subsequently introduces the playwright’s life and work from the beginning of his career to the present. The chapter argues that in his work, Greig is interested in the scenes from the world. Since conjuring up the scenes from the world in ethical ways in a play is no easy task, Greig’s plays importantly resort to the dialectical method. Theodor W. Adorno and poet W.S. Graham help the book approach Greig’s nuanced understanding of dialectics. 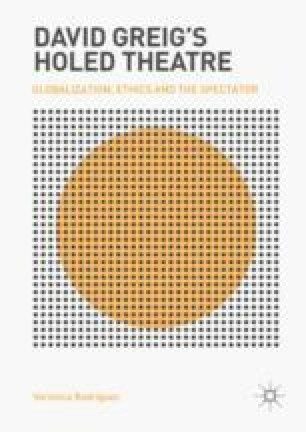 The chapter finally introduces the ideas of holes and holed theatre and presents the reader with the book’s structure.